The Nigeria Centre for Disease Control (NCDC) says Nigerians need not panic over the rising cases of Lassa fever because it has initiated measures in response to the disease in the country. Ihekweazu said that in preparation for this year's emergency phase, NCDC had been providing support to states, including emergency supplies and deployment of Rapid Response Teams (RRT). "Recent epidemiological data shows that Lassa fever usually occurs during the dry season, between January and April." 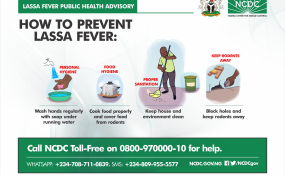 "Given this increase in reported cases of Lassa fever, the NCDC has declared this an outbreak and activated an Emergency Operations Centre (EOC) to coordinate the response," he said. "Take effective measures by storing grain and other foodstuffs in rodent-proof containers, disposing of garbage far from the home, maintaining clean households, and other measures to discourage rodents from entering homes. "Hand washing should be practised frequently. The public is also advised to avoid bush burning. "Health care workers are again reminded that Lassa fever presents initially like any other disease causing febrile illness such as malaria. "Healthcare providers are advised to practise standard precautions at all times, and to maintain a high index of suspicion." "When the RDT is negative, other causes of febrile illness including Lassa fever should be considered. Accurate diagnosis and prompt treatment increases the chances of survival. "The national guidelines for Infection Prevention and Control, as well as Lassa fever case management have been developed, disseminated to states and are available on the NCDC website for download," he said. Ihekweazu reinstated Federal Government's commitment to supporting all States' public health teams to prevent and respond to public health threats.